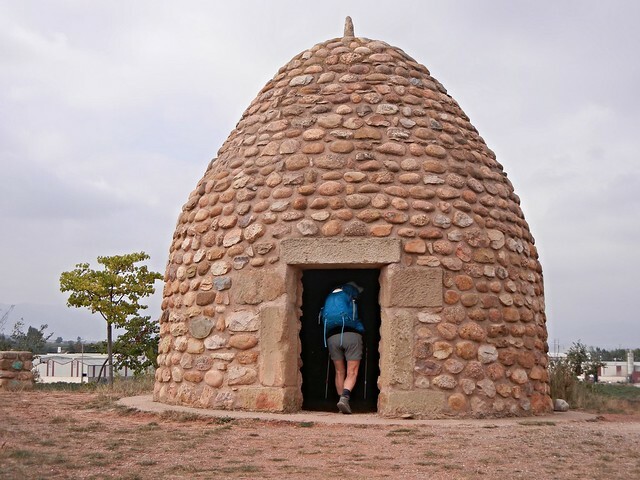 The spirit of the Camino left us two days ago when we entered the suburbs of Logrono. One has to stay vigilant in a city such as Logrono and its suburbs. 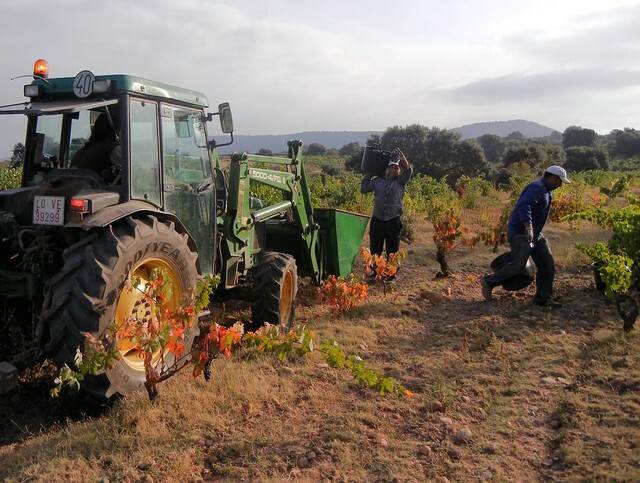 It isn’t exactly a peaceful place to be, especially when they are celebrating their wine harvest (San Mateo festival). There is no room for Camino magic. We didn’t even get it back on our walk to Navarette yesterday because of the hum of heavy traffic. Finally, today we got the Camino magic back. This morning we walked a distance of 17.4 km from Navarette to Najera, thinking that might be where we would stay the night. After a satisfying lunch in Najera, our minds changed. Suddenly we had the energy to carry on walking an additional 5.8 km to Azofra for a total of 23.2 km. It was a glorious walk through wide open spaces with stupendous views and no heavy traffic noise or other distractions. There were wonderful wide country tracks passing through remote and gently undulating farmland. Grapes, grapes, and more grapes! 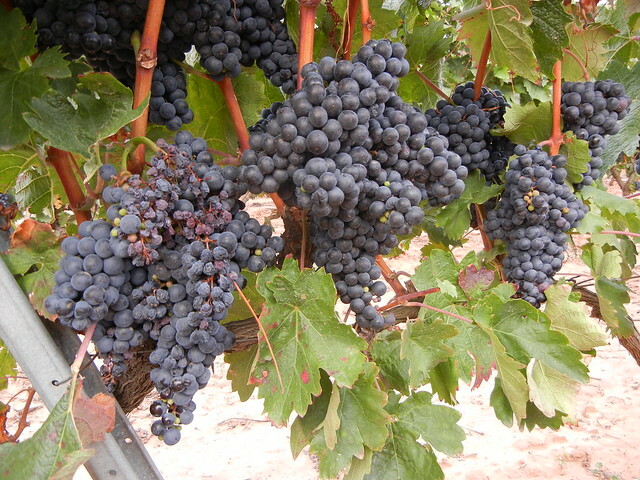 The grape harvest is beginning and at least one of the pickers was happy to pose for a picture. We also came across a strange beehive shaped stone structure and checked it out. It is in this area where, in the late 8th century, Roland is alleged to have killed the giant Ferragut. Ferragut was supposedly a Syrian giant who was a descendant of Goliath (as in David and Goliath) who had been sent to Spain to fight Charlemagne’s Christian army. He is said to have had the strength of 40 men and feared no weapon. Many of Charlemagne’s men were sent to fight the giant and were defeated every time. Finally Roland, one of Charlemagne’s knights, was able to approach the giant and fought him for two days using anything at his disposal including swords, sticks, bare fists and stones. Despite this Roland was unable to even wound the giant. On the third day the two men called a truce and sat down to discuss religion. During this conversation, and following the drinking of copious amounts of wine, Ferragut let slip that his weakest point was his navel. The next morning the two men began fighting again and Roland, remembering what the giant had told him the day before, slayed Ferragut by piercing his navel with a spear. Azofra, where we are now, is a tranquil village with a population of barely 500, a huge contrast to Logrono’s population of 145,000. There is one advantage, however, to visiting a city as large as Logrono: they have camera shops! We are still looking for a camera to replace our broken one. Our timing wasn’t good for buying a camera in Logrono, since all the stores were closed for the San Mateo celebrations. In the meantime, we are still managing with one camera. We made our way back to our albergue after doing our best to empty that bottle of wine, and now here we are: raring to hit the trail again tomorrow after (hopefully) a good night’s sleep. Destination: Santo Domingo de Calzada, a mere 15.2 km away. It feels good to have the Camino connection back again. You have already walked 203.8 KM. What an accomplishment! You are averaging almost 16 KM per day. Your brilliant smile features in your pictures, and you write with such good humour. I’m so enjoying your adventures. I am really enjoying your journey. Your pictures are fantastic. I hope that you are going to put your adventures into print for all the other lazy ones like me can enjoy. Hi Judy & Dave. I’ve been following your adventures sporadically while my sis and her hubby were with us and as they left today I’ve taken the time to catch up with your stories, beautiful photos and humorous anecdotes. What an achievement to have already walked over 200 km! 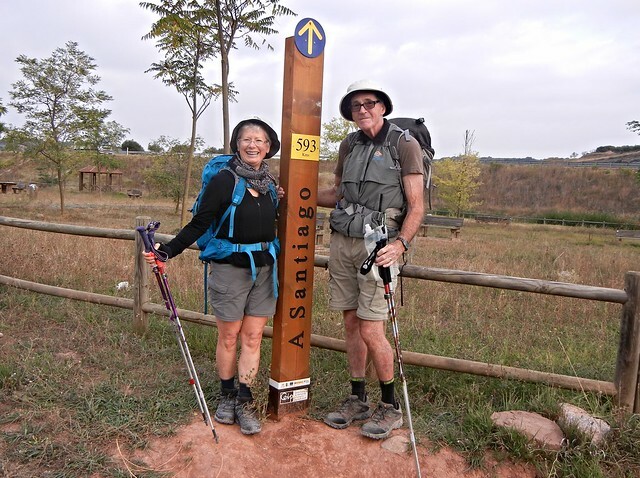 So proud of you both and through your stories and photos we’re feeling very connected to your ‘Camino Experiences’! Hugs and warmest wishes for the adventures to continue and that your feet get a little ‘tlc’ at the end of each day. Exactly, Maggie! Judy, do you know the yoga technique of lying on the bed or floor and sticking your legs and feet up the wall, or door? It’s a great way to let the feet unpuff after a long hike. You have gone a long way already and have experienced the joy of continuing even when you have reached the day’s goal. Bravo! You are awesome. What a great blog. Sorry to have missed your Facetimes. Sending love and happy feet blessings.